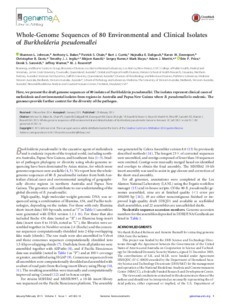 Here, we present the draft genome sequences of 80 isolates of Burkholderia pseudomallei. The isolates represent clinical cases of melioidosis and environmental isolates from regions in Australia and Papua New Guinea where B. pseudomallei is endemic. The genomes provide further context for the diversity of the pathogen.